Put the date in your diary: We’ll be holding our Christmas bash in the Pleasaunce on 8th December. Expect carols from the Halstow Community Choir, festive stalls, nearly-new toys for sale, hot refreshments including mulled wine, and a grotto, with the man himself making his now traditional unconventional entrance. What will he be riding this year? FREE entry from Halstow or Chevening Roads. 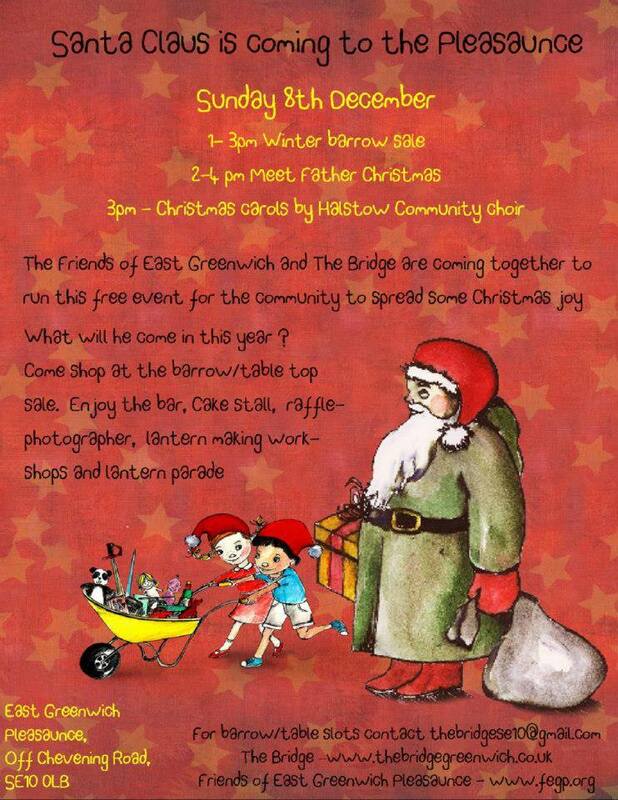 Father Christmas from 2-4pm, carols 3pm and barrow sale Christmas Bazaar from 1 till 3 pm. We would like to offer hot chestnuts on the 8th December at our Christmas Event. 50p/£1 per bag. Any volunteers to run it? Two hours max and it would be nice and warm by the BBQ turning over the chestnuts and putting them in newspaper cones. Just near the cafe and watching the band and Carols opposite you.